The word Arcana, plural of Arcanum, means secrets. 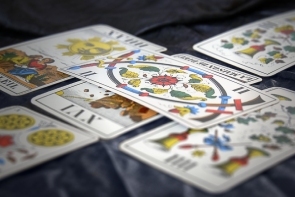 Obviously tarot cards reveal the hidden secrets of human nature and also the future of the questioners. Minor Arcana cards are also known as pips, minors, suit cards and by similar other terms. 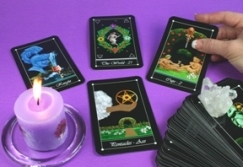 Minor Arcana cards are a part of the occult or divinatory tarot cards. They comprise 56 cards that contain four suits of 14 cards each. They provide supplementary nuances, support and information to reinforce and further elucidate the reading obtained from the Major Arcana. The names of the four suits have been derived from Latin playing cards. The most common names are Wands or Batons, Cups, Swords and Coins, also called Pentacles or Disks. Some tarot card artists have given different names as well. Each suit of cards is associated with one of the four classical elements of nature. Wands are associated with fire, cups with water, swords with air and coins with earth. Sometimes, these associations are exchanged. For example, fire is exchanged with air for suit of swords. The suit of Cups is associated with water. Water tends to flow and fill up the gaps in spaces. Cups represent the spiritual side of human personality. They symbolize inner urges, feelings and aspirations. Cups correspond with the yin energy which represents feminine side. Cups or water signify emotions, feeling, compassion, fear, bravery, laughter, happiness, sadness and so on. Swords are associated with the air element. They symbolize bravery, intelligence and passion. They are used to protect justice, truth and honor. The suit is also associated with state power that quells disharmony and rebellion. The suit of Wands represents the creative urges that express themselves through action and movement. Wands are associated with the element of fire. Wands symbolize zeal, adventure, risks, entrepreneurship, initiative and confidence. Wands signify masculinity, dynamism, aggressiveness, drive and force. The suit of Pentacles represents human concerns for security and material prosperity. They are associated with the element of Earth. Pentacles celebrate the beauty and grandeur of nature and its various creations like plants, animals, birds which contribute to our well-being, prosperity and harmony Pentacles or discs or earth represent manifestation, physical expression, creation and so on. These suits match with the four elemental tools. Minor arcana cards bear numbers starting from ace through 10. Besides them, there are four cards: page, knight, queen and king.